I have to correct myself: Other layouts don’t work either. I tested Hebrew and Turkish, but the characters are wrong. I renamed the whole config folder, but still no changes. I am at a loss. May it is not aviable because of lang is not generated? I tried that already, but nothing did change so far. Editing doesn’t work: To be more specific, Yes, I used the command and packages were installed. But the problem still occurs, changing the layout is not working. I installed Antergos before this date, unfortunately. What would be the simplest way to re-install KDE? Not yet. Still hoping that there’s another solution. I am trying to switch my keyboard to Russian, but the layout doesn’t change at all. I created a new layout for Russian Phonetic in: System Settings -> (Hardware ->) Input Devices -> Keyboard -> Layout and switched with ctrl+alt+k the layout. But nothing happens. I still have my German (latin alphabet) layout. Flags are enabled, too, so I am sure that the right layout is choosen. If I change it with “setxkbmap ru phonetic”, it works perfectly, and I can write with cyrillic letters. I tried to install gxkb and put it in the autostart, but after every reboot I need to restart gxkb in order to have the cyrillic letters, again. I have no idea what’s wrong. On my laptop with kde5 and antergos it works perfectly. Other languages seem to work, too. Removing the German layout and using only the Russian layout didn’t work either. While the problem with the notifcations seems to be fixed, the crashing menu is still an issue. Unfortunately, I can’t see anything strange in the logs. I’ve got the problem that the notifications appear on the wrong place: Instead of on the lower right corner, they appear now on the upper right corner. I tried to change it in the menu, already, but it didn’t work. And, I don’t know if there’s a link between this: Sometimes KDE crashes when I search something in the menu, not everytime, but often. I tried to rename the kde folders like local, kde4, config, but nothing has helped. 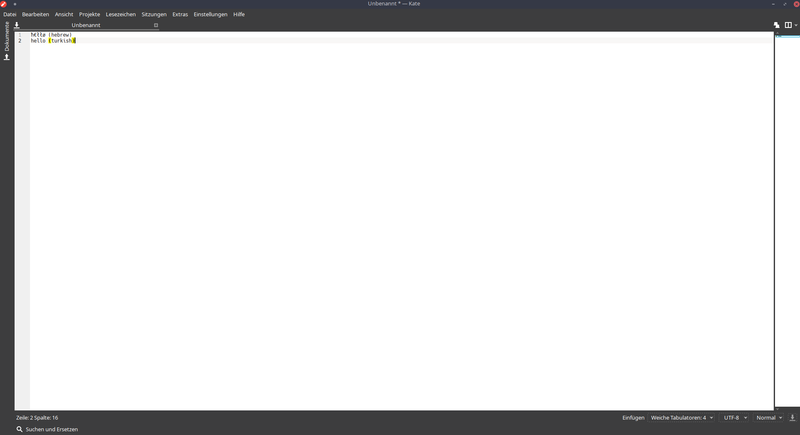 [[email protected] ~]$ Icon theme "ubuntu-mono-dark" not found. kf5.kservice.sycoca: Parse error in  "/home/ruper/.config/menus/applications-merged/xdg-desktop-menu-dummy.menu" , line  1 , col  1 :  "unexpected end of file"
kf5.kservice.sycoca: Invalid Service :  "/usr/share/applications/SHIELD.desktop"
No metadata file in the package, expected it at: "/usr/share/wallpapers/DarkestHour/contents/images/"
file:///usr/share/plasma/plasmoids/org.kde.desktopcontainment/contents/ui/FolderItemDelegate.qml:288:17: QML Text: Binding loop detected for property "width"
Both point size and pixel size set. Using pixel size. Failed to find service for Unity Launcher "application://Skype.desktop"
[2018-01-08T23:31:32.668Z]Error loading text-to-speech plug-in "flite"
[2018-01-08T23:31:37.701Z]couldn't load "/usr/lib/qt/plugins/discover-notifier/DiscoverPackageKitNotifier.so" because "Cannot load library /usr/lib/qt/plugins/discover-notifier/DiscoverPackageKitNotifier.so: (libpackagekitqt5.so.0: Kann die Shared-Object-Datei nicht öffnen: Datei oder Verzeichnis nicht gefunden)"
[2018-01-08T23:31:37.701Z]couldn't load "/usr/lib/qt/plugins/discover-notifier/FlatpakNotifier.so" because "Cannot load library /usr/lib/qt/plugins/discover-notifier/FlatpakNotifier.so: (libflatpak.so.0: Kann die Shared-Object-Datei nicht öffnen: Datei oder Verzeichnis nicht gefunden)"
[2018-01-08T23:31:38.050Z]Both point size and pixel size set. Using pixel size. Thanks, you were right. I just updated it, but I didn’t reboot. My fault. Things can be so easy. I try to use my Webcam Logitech C270, but it doesn’t work. I installed cheese to see whether it gets detected, but it says that no device is found. Therefore I used sudo modprobe uvcvideo which gives me the error: modprobe: FATAL: Module uvcvideo not found in directory /lib/modules/4.13.3-1-ARCH. The webcam itself is detected when I use lsusb. @just no, it didn’t work. But: I’ve clicked on “no acpi” and finally it was booting normally. The installer appeared. But I didn’t try to install it yet. I will try it tomorrow. Any idea why it is working now? What’s the meaning behind “no acpi”? Will it cause any problems booting with this? @n_mag nope. This didn’t work. After selecting the boot option, my screen stays completely black. No cursor blinking, nothing. No, I didn’t install gnome. See above, after trying to boot Antergos by selecting “start antergos live” this error appears. Yes, I tried to set nomodeset, but it didn’t work. The white screen appears again. I wanted to install Antergos on my computer, but it won’t work. I tried to install the Antergos Live ISO. But after choosing “Start Antergos Live” a black screen appeared with a blinking cursor. No “F”-buttons were working, the terminal couldn’t be accessed. I tried several solutions like add “modprobe.blacklist=nouveau” to the boot line, but nothing worked. I’ve downloaded the “fixed” ISO by Pilzbauer. I’ve tried to install it by following the tutorial in the wiki …/install/installing-antergos-with-a-newer-nvidia-gpu/. But again it didn’t work. A white screen appeared with “Oh no, something has gone wrong”. I really don’t know what to do else. Looks like, I have to install archlinux instead.